It was summer. My sister Margie, our cousin Rosie, and I were at my granny’s house in Healdton, Oklahoma. I had promised my mother that I would be good and not give Granny any trouble. I just hated making that promise because it was really hard to keep. What if something good came up? What if it was something I knew I would have to do no matter what or who I had promised? This could be a very hard promise to keep. Granny had promised us that we could go to a late night preview at the theater uptown. I was amazed that she said we could go because it didn’t start until 10:00 p.m. We had to get all of our chores done before we could go though. We were all excited about it, and I just knew that she was going to change her mind. Margie and Rosie had been saying all day that I was too little, and I should not get to go. Margie was twelve, and Rosie was eleven. Big deal! I knew they each had a boyfriend. That was really why they didn’t want me to go because they weren’t allowed to have boyfriends at their ages. I knew who they were, too, the Gray brothers, Richard and Robert. Yuck! They were both tall and very skinny, and they had pimples all over their faces. It made me sick to look at them. They knew I would tell Granny if they kissed their boyfriends. Yep, I sure would do whatever it took to get them in trouble. We had finished all our work, and Granny fixed cornbread and buttermilk for supper. It was really good. We had this a lot in the summer. Granny said it was too hot to cook anything else, and the buttermilk was good and cold. I wished we could have had it at home more often. We lived in Oklahoma City, and I never saw anyone eat cornbread and buttermilk except my daddy and me. Margie and Rosie didn’t like it too much, but then hey didn’t like much of anything. After supper, Granny said we had to wash up before we could go anywhere. We had to heat water on the kitchen stove for baths. Granny poured boiling water in a big, round tub; then she put cold water in to cool it off a little. We all bathed in the same water. It was too much work to boil more water and waste more gas for each person. And guess what? We went by age, so prissy pants Margie got to be first. Rosie went next, and you can guess who had to go last. That would be me. Granny used Ivory Soap, and it smelled good. I wish I was older and got to be first sometime. We were finally ready to go. Granny was going to walk us to town, but we said she didn’t have to. She walked us to town anyway, all the way up the tracks and right to the front of the theater. It didn’t matter to me, but Margie and Rosie were pretty upset because their boyfriends saw us. It was great for me! A couple of dozen kids were there and waiting in line. Granny left, and we got in line. It was quite a while before we finally got into the theater. We made it though, and we stopped at the concession stand to get cokes and popcorn. In those days, there were short cokes and tall cokes. Short was a nickel and tall was a dime. Candy bars were a nickel. Popcorn was a dime. You could go to the movies with a dollar, pay a dime to get in, and you still had ninety cents to eat and get sick on. We found a seat and waited for the movie to start. Every kid in town was there, probably a hundred kids. It got loud with all the talking, screaming, and fighting. It was great! The movie finally began. It was a western, and Gene Autry was there, not the real Gene Autry, but a kid who thought he was Gene Autry. I guess he was what we call mentally challenged these days. He was really a nice kid unless someone called him by his real name instead of Gene Autry. Then he would get real mad, and his face would get bright red. When that happened, it was time to make your exit! We are just sitting there watching the movie when I heard this familiar voice. It was Granny. She was coming down the aisle calling out our names, and the next thing I knew she was at the end of our row of seats. She was saying it was time to go. Of course, all the other kids were laughing. What else could we do? We got up and followed her out of the theater. I said, “But, Granny, they are an hour and a half long, and it was not over. We missed the end.” Margie and Rosie were not saying anything. I guess they didn’t want to get smacked. I guess I did because she smacked me good on my arm. I decided to shut up; she wouldn’t change her mind, and it was too late by then. Boy, was I mad! I was so mad I was about to blow up! Why did she do that? What was wrong with her? I promised myself I would never go back to her house in the summer. But, I did. Soon we were on the tracks walking home. Granny had the flashlight on so we could see. I saw something on the track ahead of us, but I couldn’t make out what it was. We got closer, and I could see it was a man. He was asleep on the tracks. I was stunned to hear her say that. My own daddy was a drinker, and this could happen to him. I tried to tell her that we should help him, but she wouldn’t listen. We just kept walking as she pulled me along by the hand. She said nothing. She just kept walking. Margie and Rosie didn’t say anything either. They knew it would do no good. Granny could be so mean sometimes. When we got home, we washed our faces and hands because we weren’t allowed in Granny’s bed with dirty faces and hands. We had to wash our feet, too, in a little bucket in the kitchen. We all crawled into Granny’s bed and began whispering about the man on the tracks. I waited for a long time until I thought Granny was asleep. Then, I woke up Margie and Rosie. “I am going to sneak out the back door and go pull the man off the tracks,” I whispered. I begged them to go with me, and I knew I could not move him alone. Besides, I was a little bit scared he would wake up. They finally agreed, and we got out of bed one at a time, trying to be real quiet so Granny would not hear us. Once we were out of the front gate, we took off running as fast as we could. We ran as fast as we could to the end of the road and up the hill to the tracks. We slowed down as we got close to the man because I think we got scared he would wake up. He was still asleep and snoring. We all three got behind him and gave him a big push. He was not very heavy, so it was easy to push him off the tracks and down the hill to the ditch. He sort of rolled down the hill without our help. We started running back down the tracks and down the hill when we came to the front gate. Then, we tiptoed around the house and to the back porch, went in the back screen door, and got into bed. We were so tired we didn’t even talk about it. We just fell asleep. We talked about it the next day, and we ran up there to find the man gone. I felt good about what we did, and I think Margie and Rosie did, too. I asked Granny if she thought the man got run over by the train. I thought that was a mean thing to say. We never talked about it again. So there you have it. Another day in the life of little Ruthie. We hope you enjoy this Christmas story about a family who discovers the spirit of giving even though they are too poor to buy gifts for each other. This is another true story from the life of Janice Sautter (J. R. Carter) who grew up in Oklahoma and has lived in Flour Bluff since 1968. We never did have a really big Christmas like some people do, but what we had was enough. My daddy worked in construction, and when the weather was bad, the money was just not there. And in Oklahoma the weather could get real nasty in the winter. My mother worked, too, but her paycheck would only go so far. Women did not earn very much in those days. All of us kids knew that when the weather was bad, we just didn’t have money for extra things. We were used to it, so we were never upset about it. That was just the way life was. I know our folks felt bad about it, but we kids were fine with it. We just tried to improvise. Daddy had bought a small tree at the feed store a few days before and had it in a bucket of water to keep it fresh. We started looking for things to make our own gifts, and we certainly came up with some pretty good ideas at times. Mother had already told us that there would be no gifts this year, so we were already getting prepared to get creative. The most important was a gift for our parents. That is what we always started with. “Let’s look around the house and see what we can find first,” Margie said. Margie was very creative. She could usually come up with something. She suggested that we look outside for plants that die in the winter. We could still find some that looked pretty and put them in a vase for the table. “That would be called a fall arrangement,” Margie told me. Of course I had to be the one to go outside to look. Margie got earaches, so she had to stay in when the weather was bad. I put on my coat and all the other stuff I had to wear out in the snow so I wouldn’t freeze, and out I went. Daddy was home, and he warned me not to stay out too long. It was really cold, and the wind was blowing really hard. I went across the road to a vacant lot and started looking for something that would look good in a vase. I had a paper bag and some scissors that Margie told me to take. The snow was very light, so I could see things pretty well. I found quite a few weeds that looked somewhat pretty, and I stuck them in the bag. Believe it or not, some weeds are pretty even though they are dead and dried up. I found what I thought would be enough and ran back to the house. I was really getting cold. I went in the house, and I told Margie I had a bag full. “Let me look at what you got,” she said. “Well, it better be good enough because I’m too cold to go back out,” I told her. “You’re not going back out, Ruthie. It’s too cold,” Daddy said. Margie was looking at all the stuff I brought back. Some she put in one pile; some she threw in the trash. “What’s wrong with that stuff?” I asked. “It’s just not right, Ruthie.” Margie kept picking over my finds. “I got real cold looking for that,” I reminded her. “It just won’t work,” she said. She took what she was going to keep and laid them on the kitchen table. I noticed she had found some pretty ribbon that was Mother’s. She also had some of that paper ribbon that she could make curls out of with scissors. She had used some of that silk fabric left over from our capes to decorate the vase. Mother had a bag with leftover sewing things that came in very handy. She had even found some of the gold braid that Mother used on the capes. I don’t have any idea how Margie did it, but in an hour or so, I went back into the kitchen and found she had made the most beautiful thing I ever saw for Mother. “I don’t know. I just started working on it, and this is what I ended up with,” she said, putting the final touches on the ribbon. “Mother will love it. We have to find a place to hide it,” I said. “I have a place in the closet to hide it,” Margie replied. “I wish I could make things like you do,” I said. “Now what about Daddy?” I whispered, so he couldn’t hear me. “I found this box that we can decorate. We will make him a tobacco box,” Margie said. She got all the things that she had found in the house and put them on the table. She had a cigar box, a button, and a piece of ribbon. The best item was the red, plaid fabric; it looked like Christmas! I watched her and was amazed at what she could do. She covered the box with the fabric first. Then she trimmed it around the edges with the gold braid. She punched a hole in the front of the box and pushed the shaft of a gold button through and tied it on the inside with string. Then she glued a little loop to the top of the box; that was to slip over the button to keep the box shut. I just sat there and watched her work her magic. She never changed. All of her life she made beautiful things. She was so talented. “I think it is done,” she said. “It is so pretty. Daddy will love it!” I squealed. “I hope so,” she said, turning the box to see it from all sides. We took it to the closet and hid it with Mother’s gift. Margie and I had made Christmas cards for Mother and Daddy and Junior, too. Thanks to Margie, it was all finished in one day and just a couple of days before Christmas. It was Christmas Eve, and Mother had promised we could put up the tree after supper. We knew we would have fun stringing popcorn and making paper chains out of newspaper for the tree. Then, on Christmas day, we would have a good dinner. She came home from work in a taxi that day because it was so cold. Daddy had already started supper. It smelled good in the house. My daddy was a good cook, too, just like Mother. He made the best fried potatoes with onions. Margie and I had set the table, so we were about ready to eat. Mother had to change clothes of course. She never wore her good clothes around the house, and we were not allowed to do that either. We had to change clothes as soon as we got home from school. I had a couple of spankings for breaking that rule. We finished our supper and washed the dishes. Then, we were ready to trim the tree. We had been waiting all day for that moment. Mother popped the popcorn and got the needles and thread for all of us to string it for the tree. We also had to cut the strips of paper to make the chains. Junior was doing that. We had one string of bulbs for the tree and an angel that Mother had made a long time ago. She got out a white sheet for the tree skirt. I poked my finger with that needle a bunch of times. I even bled a couple of times. I think we all did that a few times. Mother made paste out of flour and water to make the chains. It was fun making the chains, mainly because there was no needle to poke my finger. When we had finished making all the popcorn strings and the paper chains, we strung them around the tree. We had the one string of lights and some icicles left from the year before. When we had it all finished, it looked so pretty. “We did a good job on that tree,” Mother said. “I think it is really pretty,” I said. “It is beautiful,” Margie agreed. It was getting late, and we were all tired. Mother said it was time for bed for all of us. So, we got into our pajamas and went to bed. As soon as we were in bed, I started to wonder how we would get our parents’ gifts under the tree. “We have to wait until we think they are asleep,” she said. “I won’t. Don’t worry about it,” she promised. I tried hard to stay awake, but I got so sleepy. When I woke up, it was morning. Margie was still asleep. I woke her up to ask her if she put their gifts under the tree. Junior was still asleep, but he wouldn’t get up. Margie and I got up and went into the living room. Mother and Daddy were in the kitchen drinking coffee and talking. We went into the kitchen, and Mother had her gift sitting in the middle of the table. It looked real pretty. “He did come to see you both,” Margie said. “But Margie helped him make your gifts,” I said. “Do you like your tobacco box, Daddy?” I asked. “That’s all right. We don’t mind,” Margie said. We really didn’t mind because we knew there was not enough money. That was the only year that we got no gifts for Christmas. We still had a good Christmas though. Ola, Jim, and the three boys came for dinner. Ola brought us paper dolls for Christmas. That was good. We liked paper dolls. They didn’t have much for Christmas that year either. Well, we all survived it, and we had a good dinner that Mother cooked. What could be better than that? That was a happy Christmas in the life of little Ruthie. The recent snows in Corpus Christi found children and adults alike busy building snow people all over the city. 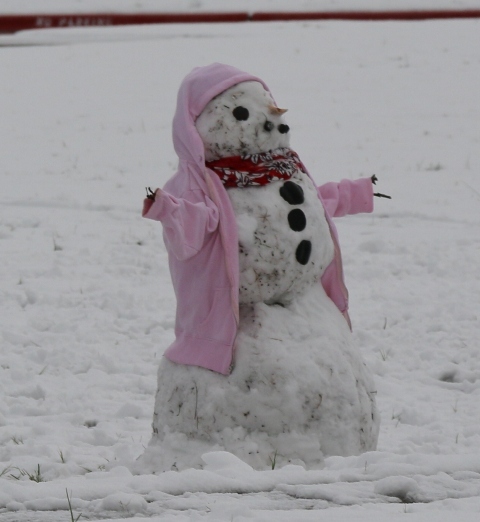 This story by Janice Sautter tells of a very unusual snow woman built in 1940s Oklahoma. It is sure to make you smile. It was wintertime in Oklahoma. I didn’t really like winter. If it snowed, it was not quite as bad. At least I could play in the snow. But, Oklahoma has a lot of sleet. It gets so cold in the winter. The wind blows real hard, and I just freeze to death. Our house was old, and the wind blew in around the windows. Mother hung blankets on the north windows to keep some of the wind out. We had butane gas and just a small gas-burning stove in the living room. Mother kept the oven on and opened the door to keep it a little bit warmer. But, when we went to bed, all the heat was turned off. She said it was too dangerous to leave it on. Then it got bitterly cold! We had big quilts on the beds to keep us warm. Granny and my mother made them. Some of them were very warm because they were stuffed with feathers. I was thankful we had the quilts, or I would have frozen to death for sure. We had just four rooms in our house: the living room, the bedroom, which had one full-size bed for Margie and me, and a twin bed for my brother, a bedroom for my parents, and the kitchen. We had a big screened-in back porch, too. I remember when I was little, I would wake up at night and be scared. I could see all kinds of things in the dark that scared me. In the winter when the wind was blowing real hard, I heard noises no one could believe. I would call out to my mother and ask her if I could sleep with her and Daddy. “Yes, there is, too,” I would say. I knew Daddy would give in if he thought I was scared. Mother would get mad at him for giving in to me. I would jump out of bed real fast and run to their bed. It was cold, and I was scared that something would grab me in the dark. Daddy would pick me up and put me in between him and Mother. It felt so good to be in their bed. I was warm and safe. “You be still now,” my Mother said. “My baby Ruthie,” Daddy would say. “What she did is not bad enough to get a spanking,” Daddy said. “That’s what you always say,” Mother replied. It was the same words every time . I knew them by heart. If she had really wanted to spank me though, she would have done it, no matter what Daddy said. My mother was the boss in our house, especially when it was about us kids. She thought she always knew best about us. It was a long way to walk to school in the winter. Margie and I always wore leggings under our coats to keep our legs warm. They had suspenders to keep them up. We had wool caps to keep our heads warm. We had galoshes to wear over our shoes to keep them dry. When we had all that stuff on, it was hard to walk. And, if we fell down, it was hard to get up. One day when we got home from school, my sister Ola’s husband, Jim, was there. He had built a big sled that a whole lot of people could sit on. He was going to hook it up to the car and pull us on it. I thought it was great. We lived on dirt roads, and there was hardly any traffic. He thought it was safe. Daddy was there, and he thought it was all right, too. Jim and Daddy tied these big ropes to the sled and then to the bumper of the car. He had boards on the front of the sled to keep it from going under the car when he stopped. The snow was real deep. It had been snowing for a couple of days. About five or six of us kids piled on it. Daddy got on to make sure everything was all right. Jim started the car, and we started moving. We went all the way around the block and were almost back to the house. It was so much fun! We all wanted to go again, but that was not going to happen. Mother pulled up in a taxicab. She was just getting home from work. She paid the driver and got out. She motioned with her hand for Jim to come to where she was. “Giving the kids a ride on the sled,” said Jim. “What if this thing slides under the car? What if that rope breaks? Get off that thing right now!” she told us. We all started getting off slowly, hoping she would change her mind. She was pretty mad though, so I didn’t really see that happening. “Getting killed or hurt is not fun. I can’t believe that you helped with this, Elmer,” she said. Needless to say, the sled ride was over for good. Jim and Daddy got in trouble, and we missed out on a lot of fun all because Mother thought we would be hurt or killed. Jim and Daddy would not let us get hurt or killed, at least not on purpose. A couple of days later, we had another big snowfall. We had school that day, so we had just got home and were trying to get warm. Daddy was home, too. He worked in construction, and when the weather was bad, he couldn’t work. He helped Mother out around the house when he was not working. He cleaned and started supper so she wouldn’t have so much to do when she got home from work. Jim was not working that day either because he worked outside, too. I looked out the window, and I could see him in the front yard. It looked like he was building a snowman. “I don’t know, Ruthie,” he said. “It looks like he is building a snowman,” I said. I got my coat and leggings on as fast as I could. I put on my sock hat and went out the door. “What are you doing, Jim?” I asked. I walked off the porch to look, and boy, was I surprised! The snow woman looked just like a lady. She had long straw for hair and eyes that looked real. She had red lips and rouge on her cheeks. She had a red scarf tied around her neck, but that was all she had on. She was a snow woman with no clothes on! I mean she looked like a grown-up woman! I had a real bad feeling about this. I went back in the house, and I told Daddy what Jim was building in the front yard. He looked like I had hit him with a ball bat. He grabbed his coat and hat and out he went. He got out there just as Mother was getting out of the taxicab from work. I didn’t go outside. I just watched out the window. She walked over to the snow woman with this real mad look on her face. She said something to Jim and then to Daddy. Then she raised her foot up and kicked the snow woman down. She said something else to Jim, and he started laughing. Daddy was not laughing. So that took care of the snow woman. Mother came in the house, and she was talking to herself she was so mad. She just took her coat off and went to the kitchen to start supper. “Yes, ma’am,” we all said. She never knew that I had been outside and got to see the snow woman, or she would have had a fit. Daddy never told her either. Jim got in his car and left. He was just laughing. He really liked to tease my mother. He knew what she would do when she saw his snow woman. I liked Jim. I thought he was funny, and he sure knew how to get a rise out of my mother. Now this was not a typical day in the life of little Ruthie. I was about nine years old that summer. My brother still thought he was the boss of Margie and me. He always took care of us in the summer while Mother worked. That was the summer he got us into another fine mess with one if his hair-brained ideas. Why did I let him talk me into those things? Mother had a charge account at this little neighborhood grocery store. She would make us a list if we needed something for lunch before she went to work. We were not allowed to add anything to the list. Most of the time, the list consisted of things like bread, lunchmeat, mayonnaise, and things like that. Sometimes she would let us get a candy bar for each of us. Tom’s Grocery was the name on the front of the store. Tom was an old man with gray hair. He was a nice man, and I liked him. He would always talk to me when I went in the store. “Are you having a good summer?” he would ask. “I guess so,” I would say. “Not too much,” I would reply. “How are your folks doing?” he always asked. We just talked about nothing really. We were just being polite. My daddy said that being polite to your elders is very important, so I tried to be polite. I loved my daddy more than anyone, so I tried to do what he told me. I didn’t do this so much with other people, like my brother. Why would I want to be polite to him? He was never polite to me, so I figured you get what you give. So, I tried to give him just what I thought he had coming, which was as much trouble as I could think up. I wanted him to do his job as the person in charge. I would not refer to him as a babysitter because I was not a baby. He would tell us sometimes that he was our babysitter just to get me mad. Margie didn’t care. She liked being a baby because that was her way of getting what she wanted from Mother. One day Margie and I were getting ready to go to Tom’s store to buy what Mother said we could have for that day. Junior never went; he was too lazy to walk that far. He said it was too hot. I guess he thought Margie and I didn’t get hot. I liked being outside, even when it was hot, so I didn’t care, and I got away from Junior for a while. “We’re going to get some candy and cokes,” he said. “But that is not on the list,” I said. “Yes, she will, and we will be in big trouble,” I said. “No, I can write just like Mother. I will just add a few things to her list. She will never know, and old Tom will not figure it out either. I have been practicing to write like her,” he said. Margie and I finally gave in, but we were both against it. It seemed wrong to me to spend money that my parents might not have. The extra things he added looked just like my mother’s writing. I couldn’t believe it! He added three cokes, three candy bars, and three ice cream bars. That really sounded good, but I still didn’t feel right about it; neither did Margie. We went along with it because the big boss said so. I just hoped and prayed we wouldn’t get caught. We finally agreed on what we were going to do, and Margie and I left to walk to the store. Both of us were scared all the way to the store. Everything inside me was saying not to do this. It was wrong. I felt like a thief, like I was stealing from my own family. I think Margie did, too. We didn’t talk much all the way to the store. Finally, we are in front of Tom’s store. We looked at each other, opened the door, and went in. We started looking around the store and getting the things Mother had put on the list. What we were allowed to get was bread, bologna, and a quart of milk. We had to get Tom to cut the bologna on the meat slicer. We were to get one half pound. He gave us the bologna, and we went to get the three cokes, three candy bars, and three ice cream bars. We put everything on the counter so he could ring it up. To my surprise, he pulled out this little tablet, put a carbon paper between two pages, and he wrote down everything we got in that little tablet. Then, he added it all up and pushed the book over for us to sign it. I picked up the pencil and wrote Ruthie on the paper. Mr. Tom put all the groceries in a paper bag and handed it to us. We had done the my brother’s dirty deed, and I was not feeling good at all. I looked at the copy he gave us of the items we bought. “What’s wrong with it?” she asked. I hated my dumb brother. He was so stupid! Why did I listen to him? I am stupid to for doing what he said. I know who is in the big trouble. It is me because Junior is her little boy, and Margie is always faking an earache. That leaves me. Not to mention I signed the grocery ticket. I am so mad at myself. We got home, and the big dummy was waiting for us. It was just Wednesday, so we had until Friday evening to worry about it. I was trying to get my mind off of it, but I felt so guilty I couldn’t forget about it. I do believe I was having nightmares about it. I ate the ice cream and candy that day, and I drank the coke. I was already in danger of going to hell for liking to dance, and now I was a thief. What was worse, I stole from my own family. We spent money that Mother probably didn’t have, and I felt really bad about that. I was feeling bad about eating the candy and ice cream and drinking the coke. On Thursday, I told Junior and Margie that I was going to tell Mother what we did. “You better not!” he yelled at me. I didn’t say another word. I knew they would never agree to help me tell her. I decided to wait until Daddy got home, too. Maybe he would help me out a little. I worried all day Thursday. I practiced what I would say. I didn’t want Margie to get a hard spanking. She was frail like Mother said. I was stronger than she was, and I could take it. I knew at that moment that I really did love my sister very much. When Mother got home Thursday night, I was so scared. Junior left and went to his friend’s house. His name was Kenny Jones. Margie and I were there by ourselves. Daddy came in soon after, and I told Margie it was time to tell them. Mother was cooking dinner, and Daddy was sitting at the table drinking a beer. They were just talking. She turned and looked at us. I sat down at the table by Daddy, and Margie sat down in the same chair with me. I explained to her that Junior could write like her and explained what he added to the grocery list. I was starting to cry, and so was Margie, but I went on with the story. I told her I knew we would get caught because Mr. Tom had it all written down in his little book. I told her that Junior threw her copy away and said we lost it. I told them that we were sorry that we stole from them and that we spent money we didn’t have. They just sat there and looked at us. Then they looked at each other. They both began to laugh. I thought they had gone crazy! I was so happy that we told the truth. Maybe God would forgive me for stealing, too, and I wouldn’t burn in hell for it. I still had the problem of liking to dance though. I learned a lesson that night. I don’t know if they ever punished Junior or not. He didn’t come home that night, so they were probably so glad to see him when he did come home that they just forgot about it. This had been a very interesting week in the life of little Ruthie. Summers were difficult in our house. Mother and Daddy worked every day. Ola and Jeanie were married with their own kids, so that left the three of us at home. By the three of us, I mean Junior my brother who I thought was an idiot but later figured out that this wasn’t always true. Sometimes he was smarter than me, if anybody can believe that. I know I found it hard to believe when he would put one over on me. The second of the three was Margie, my big sister. She hardly ever got involved in the battles that went on between Junior and me. All she was interested in was clothes and shoes. She loved ribbons and bows, too. She was a real girly, girl, if you know what I mean. I, on the other hand, was kind of a tomboy type of girl. I liked the outdoors and the creek, and I liked adventure. I wanted to try new things. The problem with that was I usually always wound up in trouble. My brother, the idiot, was always in charge, of course. He was sixteen that summer. Margie was twelve, and I was ten. I was beginning to think that I would never get to be in charge of anything. Being the youngest in the family is hard. I had to literally fight for my life at times. They were all older and bigger than me, so I always get picked on. Margie always sided with Junior because she was afraid he would beat her up or tell Mother if she did something she shouldn’t have done. This didn’t happen too often because she actually tried to be good. She and I had fights now and then. I beat her up, and then she left me alone for a while. Sometimes she got the better of me though if Junior helped her. In the summer months, Mother would call us on her lunch hour to see how we were doing. Of course, we told her we were fine. My sister Ola would come by occasionally to check on us. Sometimes she would take Margie and me with her to her house. Once we got there, we knew why. She wanted us to help her clean her house. She was a terrible housekeeper. At least that’s what my mother said. “If you girls help me clean my house, I will pay you,” she said. “How much will you pay us?” I asked. “Yeah, you’re house is really dirty, Ola,” Margie said. “But you have to pay us now, before we start,” I said. “Why is that?” asked Ola. She went into the kitchen and handed us each fifty cents, and we put it in our pockets. We worked nearly all day on her house. What a mess! Of course, we watched her kids while we were there, too. She had three kids by then: Larry, Bobby, and Randy. There was only one year’s difference in Bobby and Randy. They were all cute little boys, and I rather liked taking care of them. They were fun to play with. When we were all finished, she took us back home, but she didn’t stay long. She said she needed a nap, and so did the kids. I don’t know why she needed a nap because she sure didn’t do anything that I knew of. The kids needed a nap though. They all three looked sleepy. Margie and I gave them all hugs and kisses, and off they went. I couldn’t believe Ola actually paid us. When we got home, Junior was lying down on the couch sleeping. The door slammed when we went in, and it woke him up. That made him mad, and he began to yell at us. “What are you two doing now?” he screamed. “We just got home from Ola’s,” I said. “Well, be quiet,” he said. That did it! He called me a bad name. I jumped on top of him and started hitting him and, pulling his hair. He was trying to get my hands loose from his hair, but he couldn’t. I had a good grip on him. He put his hand in my face and was trying to make me let go. I got his finger in my mouth and bit down as hard as I could. Boy, did he let out a yell then. He finally was able to get me loose and threw me on the floor. We were both mad, and what we did when we got this mad you won’t believe. “This is war,” I said. “Fine, let’s get the weapons!” he shouted. The weapons were the silverware. We could use everything except the sharp knives. We went into the kitchen and dumped the silverware on the table. We drew straws to see who picked first. Junior won the draw, so he got first pick. We could not use the meat forks either. Junior picked a fork for his first pick. I picked a fork next, and Margie picked a fork. When everything was off the table, we went back into the living room. There were two big platform rockers in the living room that we turned over for a fort. One of us would get behind the couch. “Everyone needs to take cover. The war is about to start!” said Junior. “No cheating. You can only throw what you have now. No going back to the kitchen,” I said. I hated it when he called me that! Margie was behind the couch, and Junior and I were behind the rockers. I know this was a crazy thing to do, but we were kids that were not supervised very well in the summer. We would do just about anything. I don’t think we really knew how bad we could have been hurt. It was something to do, so we made a game of it. We were all under cover, so it was time to begin. Junior threw first at me, of course, and after that, it was just all of us throwing whatever we could at whomever we could. No one ever got hurt. I can’t imagine why. After we ran out of ammo, the game was over. We would pick up all the silverware and put it back in the drawers. Then we would clean up the living room and set the rockers back up. For some reason we were all in a better mood after we had a war. I don’t know why. We could actually be nice to each other. Even Junior was better. Sometimes he would ask us if we wanted to play catch in the front yard. It was fun when he was nice to us. I liked him when he was like that. He would laugh and tease us. We could even wrestle in the grass and not be mad. It had turned out to be a good afternoon in the life of little Ruthie. I cannot in my wildest dreams imagine why my daddy would buy my brother a gun. But, he did. Junior was not a hunter, so that was not the reason. He gave it to him for Christmas when he was about sixteen. It was a shotgun. I did not know what kind it was then, but later I learned it was a sixteen gauge. I do remember he was very happy that Christmas when he got the gun. My Mother was not happy. “Why in the world would you buy him a gun, Elmer?” she asked my daddy. They argued for days about the gun. My mother was always the boss around our house, so I figured Junior would not get to keep the gun. I think Daddy wanted to do something for Junior that was just between the two of them. They were never very close because of my Mother. She always told Junior what he could and could not do. I think my daddy wanted a relationship with his son, but my mother prevented that for some reason. As I said before, he was never punished for acting up. He could do anything and get away with it. More than once, Daddy was going to spank him when he did something wrong, but she would not allow it. She treated Junior like royalty, and I never knew why. If there was anything he wanted, she tried to get it for him. But, the gun was something he wanted, and Daddy got it for him. I believe that was the whole thing. If she had bought it for him, it would have been all right. I could be wrong though, but I don’t think so. Mother was insisting that Daddy return the gun, but he would not give in to her on this one. On and on they went. For days, they argued about the gun. I was getting real tired of hearing it. My daddy was not a person who liked to argue. When she would start talking about it, he would just go outside. Mother would not give up though, and Daddy would not give in to her. Daddy was in the back yard one day, and I went out to talk to him. Sometimes we would just sit and talk while Daddy drank his Progress beer. Things kind of quieted down for a while. The gun was locked up most of the time, so I guess it was out of sight, out of mind. I know my mother though. Once she has her mind set on something, it is hard to change it. Maybe that is where I got it. I am the same way. When I had something on my mind, I was going to do it or die trying. However, this was different. Or, at least I thought it was. This was my daddy trying to do something for his son, his only son. I felt so bad for him. He wanted to be friends with Junior so bad. Why couldn’t my mother see that? One day when Mother and Daddy were at work, I walked into the bedroom, and Junior was sitting on the bed with the gun in his hands. He had a box of shells sitting on the bed, and he opened the gun to put a shell in it. I moved away to the other side of the room. I was scared that he didn’t know how to load it. He put the shell in and closed the gun. I was just about to say, “Take your finger off the trigger,” but it was too late. The noise it made almost deafened me when it went off. Thank God, he had pointed the gun at the ceiling! Paint, plaster, and wood chips covered the bed, the floor, and us. Junior looked scared to death. He dropped the gun on the floor. Margie came running into the room. “The gun went off by accident.” I said. We all looked up at the ceiling at the same time. There was a big hole there. I don’t know how bad it was, but it did not look good. “I didn’t mean to do it,” Junior said. “I know you didn’t,” I said. He picked the gun up off the floor, put it in the cabinet, and put the lock on it. He still had such a scared look on his face. I was scared, too. My ears were still ringing from the shot. This was really a mess! “Not me. I didn’t do anything,” Margie said. I went to get the broom, and I told him to shake the covers on the bed to get all the pieces of the ceiling off them. “I got the broom and the dust pan,” I said. Junior was sweeping when I came back. Margie was doing nothing, just watching us work. I started dusting, and that’s when I knew just how much dust was on everything. It was a mess. We cleaned almost all afternoon until it looked like Mother had cleaned it. Well, maybe not that good, but it looked pretty good. There was only one problem left, the big hole in the ceiling. There was nothing we could do about that. We couldn’t hide it anyway. We had to tell them. It’s not like we could hide a hole in the ceiling from our parents. Junior was going to have to tell them. He fired the gun, so I thought he was mostly to blame. I just stood there and watched him. “It was an accident. He didn’t mean to,” I said. “What has been going on here?” Mother asked. They both went in the bedroom to look at the ceiling. They were just standing there looking up when my mother just went crazy. She began to scream at Daddy for buying the gun. Then she was screaming at Junior because he could have killed one of us. I had never seen her so mad. ‘Not Margie. She wasn’t in here. She just told on us,” I said. “Ruthie didn’t do anything. She just happened to be in here,” Junior said. “Well, he didn’t shoot anybody. Thank God. I can fix the ceiling,” Daddy said. He was trying to get her off the subject of the gun by saying he would fix the ceiling. I knew my daddy. He was smart. But, it didn’t work this time. “That gun is leaving this house,” Mother said. “Now, Ellen,” he started to say. Junior didn’t say anything. I think he was glad the gun was going because it had caused a lot of arguments. I think he knew what she said was true. One of us could have been shot that day. The next day, Daddy did sell the gun to a guy he worked with. He gave Junior the money out of the gun because it was his gun. Mother got mad about that. She didn’t think Junior should get the money because of what he did, but Daddy gave it to him anyhow. Junior and Daddy became a little bit closer after all that happened. I was happy about that. I was really mad at Margie for sticking her nose in where it wasn’t needed. I told her I was going to beat her up for what she did to Junior. I didn’t do it, but I sure wanted to. I knew I would get a spanking if I did. She was always like that when we were growing up. I don’t know why. I never told on anybody just to get them in trouble like she did. But, she was Mother’s favorite. She was frail and sickly my mother would regularly remind us. I didn’t believe that for a minute. She was just a little snot nosed, spoiled brat. 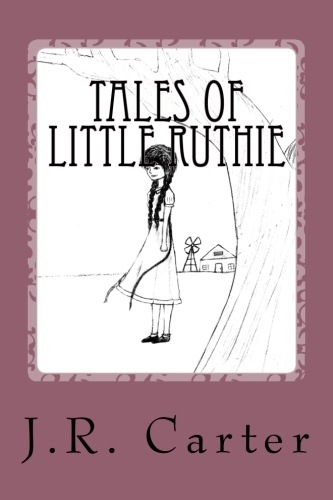 Well, this is another story in the life of little Ruthie, and believe it or not, I am still alive. Playing baseball was one of my favorite things to do. There was an empty lot behind our house where at least ten of us kids from the neighborhood would get together to play. We usually played late in the evening when it got cooler. Usually Margie and I were there, and Junior played sometimes. Then there was Annie along with Jeanie Lou and the boys cross the street from us, LeRoy and Lindell. Then there was Novelene and Charles who lived on the corner. Most of the time there were about ten of us, but if we didn’t have enough for a game, we would just take turns hitting flies to see who caught the most. “Yeah, let’s do that,” Margie said. “I don’t know if I can,” said Jeanie Lou. “We will go with you to ask,” I said. We did that all the time. If one of us thought any of the mothers would say no, then we would go together to ask permission for that one. I guess we thought we were stronger in numbers. Sometimes it worked, and other times it didn’t. About five o’clock all of us girls went to Jeanie Lou’s house to beg her mother to let her play baseball. She had just come home from work. Jeanie Lou had no daddy. I never knew where he was, and she never said. “Please, ma’am, we really need her to play third base for us,” I said. “She is our best third baseman, ma’am,” Annie said. “Well, I guess she can, but she has to eat first,” she said. “Thank you, Mama, for letting me play,” said Jeanie Lou. “It worked!” we all said as we were leaving. I told Jeanie Lou to hurry and eat supper, and we went back to our house. All of us had to eat supper before we could play, so we agreed that we would meet in the field at six o’clock. While Mother was cooking, I was telling her to hurry because we had a ballgame to play. Finally we were finished with supper, and we helped clear the table. “Do we have to wash dishes?” I asked. “Oh, thank you, Mother. Thank you so much,” I said. We were ready to go. All three of us ran out the back door. The field was right behind our house, so we were there real quick. Novelene and Charlie were there already. The five of us sat down to wait for the others. It wasn’t long before Jeanie Lou and Annie came. We were waiting for LeRoy and Lindell. I didn’t really like LeRoy and Lindell, but we needed them to play. They were both mean, and I was kind of scared of LeRoy because he hit me in the head once with a garden hoe for no reason. Junior said LeRoy wouldn’t hurt me though, not while he was there. This was another nice moment with my brother. He actually said he would protect me. I loved him for that. “Okay, let’s play ball!” Junior yelled. Junior was the pitcher. I was the catcher. LeRoy played first base, and Lindell was on second. Jeanie Lou was on third. Novelene and Annie were outfielders. Charlie got to bat first. We didn’t have enough kids to play the right way, but we made do. We still had Margie to bat, too. We just kind of played it by ear as to who got to bat next. Charlie got a good hit and ran to first base. Margie was up next. It scared my parents half to death. They ran to the ball field as fast as they could. I was just starting to wake up when I saw Junior beside me. Then I saw Mother and Daddy. “I’m okay, Daddy,” I managed to say. He carried me to the house, and all the kids were following. I guess they wanted to see if I was dying. Daddy laid me on the bed, and Mother got a wet towel and put it on my forehead. “I have an egg on my head?” I asked. “Not a real egg,” Daddy said and laughed at what I said. “Can I go back out to play ball now?” I asked. “No, ma’am, you cannot play any more ball tonight,” Mother said. I was pretty upset about not being able to play, but my forehead was hurting a little bit, too. Mother gave me an aspirin for my headache. The game was over for the night. Margie and Junior went out to tell the kids we couldn’t play anymore, and all of them went home. Mother heated the bath water and got me and Margie ready to take a bath. We had a new tub. It was a long one, long enough for me and Margie both. When the water was hot, she poured it in the tub; then she put cold water in to cool it off. She picked me up and carried me to the tub then set me down in it. She took her time giving us a bath. I think she was trying to keep me awake. I was feeling sleepy, but she kept me awake. I loved playing baseball, and we spent many hours playing in that field. After that, I was more careful about getting too close to the batter’s box. It seems like I was always getting hurt. I was starting to think I was accident prone. I really hoped it was just another day in the life of little Ruthie. Uncle Steve lived in a place called Price’s Falls. It is near Turner Falls in the Arbuckle Mountains just south of Davis, Oklahoma. Steve is Mother’s brother. Mother took Margie and me there to visit for a few days one summer. Daddy’s sister was there with her two kids, Kathryn and David. We were double cousins with them because Mother’s brother, Joe, was married to my daddy’s sister, Cecil. This is what made us double cousins. I was about nine years old, but it was the first time I had met them. I just remember that David was really a mean kid. Kathryn, who was in her teens, was older and nicer. When I first heard we were double cousins, I didn’t know what it meant. Did it mean I got two cousins instead of one? I sure didn’t want two of David. One was too many for me. I was already thinking hard about what I could do to get him back for the things I was sure he would do to Margie and me. Uncle Steve’s wife, Helen, and my mother fixed our breakfast. We had eggs and sausage, not oatmeal. What a treat! It was Saturday and market day, which meant the pigs my Uncle Steve raised would be sold that day. There was a whole bunch of them in a big pigpen. I was looking forward to that. I had never herded pigs before. All of us kids put our old clothes on because the pigpen was a mess. We had to get the job done early so he could get them to the sale barn in Davis. Margie, David, and I had to herd the pigs into the truck. My uncle watched to make sure we did it right. We went down to the pigpen and climbed over the fence. The pigs were bigger than I thought. I was a little bit scared. We all just stood there looking at the huge pigs. I took one step, and I was in mud up to my knees! I just took off running as fast as I could in that mud, waving my arms at the pigs. It scared them so they began to run all over the place. I was yelling at David and Margie to help me, to cut them off so they would have to go through the chute and into the truck. I could see this job was going to be harder than I thought. I was not going to quit though. The three of us were running and yelling, and the pigs were running and squealing. We got about ten in the truck, but there were still at least twenty more. Because we had fallen several times during the chase, mud and pig poop covered us! After a while, we actually started having fun. We were laughing, running, and falling down, and the pigs were running from us. I looked over at my uncle; he had a big grin on his face. Then I saw my mother and aunt watching us and laughing so hard they were about to cry. It took a good hour to get the rest of the pigs in the truck, but we did it. We were really proud of ourselves. What a mess we were with mud and pig poop all over us! We went to the house, and my aunt turned the water hose on us. Mother brought us out some soap and towels, and we washed our hair. Before long, we were cleaned up pretty well. Uncle Steve was in the truck getting ready to leave for the sale barn. He stopped, got out of the truck, and came over to us. He gave us two dollars each for helping him. We thanked him for the money, but the pride we felt for working so hard was better than the money. We were all scared to death of those pigs when we first got in the pen with them, but somehow we managed to get it done. Since Uncle Steve paid us for helping, we must have done a good job. At that point, the day was good. I just didn’t know what was in store for me later that day from David. David was the cousin from hell. He was always hitting me or pulling my hair or something just to be mean. He left Margie alone most of the time, but I guess he just didn’t like me. I can tell you the feeling was mutual. He was the only boy I knew who was meaner to me than my brother. We all three went for a hike later. The whole time we were gone he was smacking me and twisting my arm behind my back. I finally had enough, and I picked up a rock and threw it at him. It hit him in the back. I took off running from him, and I almost stepped on a big snake that slithered into my path. Now, I am really scared of snakes, and I screamed! I had seen a snake like that one at Granny’s house. It was a blue racer. Granny said they would chase a person until they caught him just so they could bite him! I know now that is not true, but, at that time, I just knew what Granny had told me. Well, needless to say, I didn’t waste any time getting the heck out of there. We were not far from the house, and I was running as fast as I could. All the while, David was right behind me, yelling that the snake was about to catch me. I was too scared to look back, so I just kept running as fast as my legs would go. Then the most terrible thing happened. I fell down! I just knew the snake was going to get me and bite me. Then I heard David laughing and laughing. My sister was even laughing! David ran up behind me, grabbed my arm, and twisted it up behind my back. I was so mad! He fooled me and made me cry. I was kicking him and trying to get away, but he just held on tight to my arm. He walked me all the way back to the house like that until we got to the backyard where Mother was hanging up clothes. He let me go then so he wouldn’t get in trouble. We went into the house to have lunch. My mother and aunt fixed us bologna sandwiches and glasses of cold milk. It was good. After I ate, I went into the backyard. I was sitting on the porch just looking around the yard. I saw what looked like a storm cellar, so I went to see it. I didn’t want to go inside. I was scared of cellars. I was standing up at the top of the dirt steps looking in trying to see as much as I could when I felt someone push me from behind. Down those stairs I went! The next thing I knew, I was on the floor of the cellar. I looked up the dirt steps, and there was David. He started to close the door! I tried to get up to run up the steps, but he was too fast. I could hear him laughing and saying he was going to lock me in there. He sounded like the devil himself. It was so dark I could not see my hand in front of my face. I knew what was in there though. I had been in dirt cellars. They had spiders, bugs, and worms. I could just feel them crawling on me! I was screaming bloody murder for someone to get me out. It was so dark. I got up on the steps as close to the door as I could. There was a little bit of light, and I could see through the door. I was begging David to let me out. I told him I couldn’t breathe, that I was dying. Little did I know that he had gone into the house. I started to push on the door to open it, but it was so heavy I couldn’t budge it. I prayed to God to save me. I cried and cried. Then I pushed on the door some more, but I had no luck. It was just too heavy. I began yelling for my mother. She didn’t hear me though. I promised God if He would get me out of there and save my life, I would be good from then on. It seemed like I had been in there for such a long time. Then- thanks to God – the door opened, and there was my mother. She asked me how I got locked in there. I was crying so hard I could hardly talk. I had been so scared. She put her arms around me, hugged me, and she wiped my tears and the dirt off my face with her apron. She had come out to get the clothes off the line, and she heard me screaming and crying. We went into the house, and my mother told my Aunt Cecil she needed to talk to her in the bedroom. David was sitting there, and from the look on his face, I knew he was scared. He got up and went into the bedroom. In just a couple of minutes, I heard a sound that I knew so well myself. It was a belt, and Aunt Cecil was really giving it to him. I was so happy to be out of the cellar that I forgot to count how many licks he got. Darn it! David didn’t come out of the bedroom until supper time. Uncle Steve was back from the sale barn and had sold all his pigs. We had a real good supper. We had ham, green beans, mashed potatoes and gravy, and hot biscuits. Every time I took a bite of ham, I thought about chasing those pigs that day. Before we went home the next morning, Aunt Cecil made David apologize to me for what he did. I had fun while we were there, but I never wanted to see my double cousin again. The day at my uncle’s pig farm was more than a typical day in the life of little Ruthie. I thank God for getting me out of that cellar! Annie was one of my neighborhood friends who lived on the street behind us. We often played jacks and hopscotch together. Actually, there were five of us girls who played together: Annie, Jeanie Lou, Novelene, Margie, and me. Most of the time, we played jacks, hopscotch, or Red Rover Come Over when we had enough kids. We also played Simon Says. In the daytime, if it was too hot outside, we would play paper dolls or color in our coloring books. We all liked the coloring books that had princesses in them. Their dresses could be so pretty if we did a good job of coloring and stayed in the lines. I liked the pretty, pastel colors. Then, I would use a darker color to go around the edges. I loved to color, and I was pretty good at it. My sisters, Jeanie and Ola, taught me how to color when I was real little. The hard, fast rule was to always stay in the lines and do not scribble. Later on in life, I taught my great granddaughter Taylor how to color. She learned the rule very quickly, to stay in the lines. She always thought the color white did not work, but she stayed in the lines. It was summer, and Annie, Jeanie Lou, Novelene, Margie, and I had been playing together all day. It was getting close to time for my mother to come home from work, so my brother Junior was still the boss. “You kids are gonna have to go home now,” he said. “Why do you have to say it so mean?” I asked. He knew I hated it when he called me brat. The girls picked up their coloring books and crayons and started for the door. Margie and I followed them out to say good-bye. We were standing on the front porch just talking. “You think you can come over later to play?” Annie asked me. Margie and I went back in the house. I was really mad at Junior for being so rude to our friends and for calling me a brat two times. I knew I could not let this pass. He would do it all the time if I did. He was sitting in the big rocker, and I attacked him from behind. I grabbed his hair and would not let go. He got loose from me and jumped out of the chair. When he was out of the chair, I ran and jumped on his back. He tried to swing me off, but I held on. I was hitting him with my fists. He was hitting me, too, and it hurt like the dickens! He always hit me on the top of my arm and rubbed his knuckles real hard on my head. I finally broke loose from him. “Why do you call me brat?” I asked. I didn’t say anything else. I knew he was right. Daddy wouldn’t do anything because Mother wouldn’t let him. Junior was the number one kid in her eyes. He always got his way. They never listened to me because I was the baby of the family. Sometimes they listened to Margie if she told on him, but he never got punished like we did. I got the most punishment of all of us. I guess some of it was my own fault, but I had to stand up for myself. I was kind of hardheaded I guess. I didn’t know what else to do when someone was mean to me. I went into attack mode. Just as I decided to shut up, the telephone rang. “I’ll get it. It’s for me,” Junior said. He answered it and looked at me. I hated him so bad at that moment I wanted to kill him – or at least hurt him real bad. It was Annie. She asked me to eat supper at her house. “Is it all right with your mother?” I asked. I hung up the telephone, looked at my brother, and made an ugly face at him, just to let him know that I got telephone calls, too. I didn’t tell Junior what she wanted. I knew he would do anything he could to spoil it for me. Sometimes I wished that I could go live with my sister Jeanie. She had always taken care of me. I thought she was my mother when I was little because she was always the one there for me. She wanted me to live with her, but Mother wouldn’t have it. When Mother got home, I asked her if I could go to Annie’s house for supper. I washed my face and hands, combed my hair, and got ready to go. I ran out the door yelling good-bye. I was at Annie’s house real quick. I knocked on the door, and Annie let me in. Supper was not ready yet, so we went to Annie’s room to play. Their house was old like ours, but ours was a lot cleaner. My mother kept our house spotless. Annie’s dirty house didn’t bother me though. Annie had an older sister, Delores, and a brother who was my brother’s age. His name was Kenneth. She also had a little sister about five years old. Her name was Sarah. They were a nice family, and I liked all of them. Her daddy’s name was Frank, and her mother’s name was Betty. It was not long, and her mother was calling us for supper. We ate in the kitchen. They had no dining room. Neither did we, so I was used to that. We had pinto beans and fried potatoes with corn bread and sliced tomatoes. It was a good dinner. I liked everything we had. We had water to drink. They were poor, just like we were. I was happy, though, because Mother let me go. She would gripe the whole time she was cleaning it up. After we finished supper, I told Annie I would help her with the dishes. Her mother went into the living room to smoke while Annie and I started cleaning the kitchen. It was just the two of us. We had to heat water to wash dishes at her house just as we had to at mine. They had only cold water just like us. We had quite a few dishes to wash, so we hurried to get finished. Before we knew it, we had everything washed, dried, and sitting on the table. That is when it happened. I picked up a stack of about eight plates to put them in the cabinet. I made it to the cabinet all right, and then I don’t know what happened! The next thing I knew I had dropped every plate in the floor! And every plate broke! It was a noise so loud that I bet it could be heard all the way to China! Everyone came running to the kitchen. I was so embarrassed. I could feel my face turning red. I just wanted melt into the floor. She told me I had better go home because it was getting dark outside. I ran as fast as I could all the way home. I ran in the back door and started telling Mother what happened. I was crying so hard she could hardly understand me. I never felt so bad in my life. “Let me look up here,” she said. It was a miracle, I guess. She reached high into the cabinet and started pulling out plates. They didn’t all match, but neither did the ones I broke. Some of them matched though. They were nice plates, too. She counted out nine plates. We walked down the path to Annie’s house, and I was feeling much better. When we got there, she knocked on the door, and Annie’s mother came to the door. We went home then, and all the way, I was so thankful to my mother. She saved my life. I was so grateful to her. I changed my mind about moving to Jeanie’s house that night. My mother was right there with me in our little house. That was one of the best days that little Ruthie ever had.